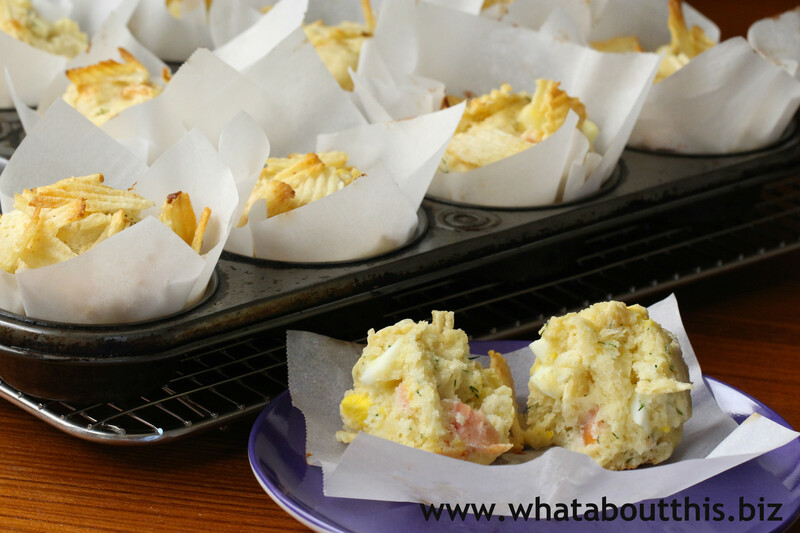 Savory Brunch Muffins | What about this? 12 – 1 = 11. But in the world of muffins, 12 muffins – 1 muffin = 1 very happy tummy. Combine traditional brunch ingredients – eggs, smoked salmon, and fresh dill – and present them in a delightful and portable manner. These muffins, topped with crunchy and salty potato chips, make for one fabulous brunch-to-go, or serve them hot at your next brunch gathering. 1. Preheat oven to 400°F. Grease twelve 2½-inch muffin cups or line with parchment paper squares; set aside. 2. In a large bowl stir together flour, sugar, baking powder, baking soda, and salt. Make a well in center of flour mixture; set aside. 3. In a 2-cup measure whisk together buttermilk, sour cream, eggs, butter, and dill; add to flour mixture. Stir just until moistened (batter should be lumpy). Gently fold in salmon and chopped eggs. 4. Spoon batter into prepared muffin cups, filling each three-fourths full. Sprinkle crushed potato chips over batter in cups. 5. Bake 15 minutes or until golden-brown. Cool in cups on wire rack 5 minutes. 1. I cut parchment paper into roughly 5-inch by 5-inch squares. Try not to get any batter on the paper when filling the cups. After baking, any batter stuck to the paper will appear as dark brown spots. This is not the worst thing in the world, but it will look a little messy. 2. Place the potato chips in a plastic bag and crush with your fingers. Some of the potato chips should be slightly pressed into the batter or else they will all fall off after baking. 3. Don’t overbake these muffins or they will be dry. 4. The next time I make these I will add a pinch of black pepper and some snipped chives or chopped green onions to the batter to enhance their flavor. 5. Because of the salty potato chips and smoked salmon, there is not a lot of additional salt added to the batter. If you like your food saltier, cautiously add more salt only after you have determined the degree of saltiness of the salmon and potato chips you are using. Not all smoked salmon or potato chips have the same amount of sodium.